We’re back with another contest for our Cacoo users! To promote our new Cacoo for Education plan, we will be holding a weekly diagram contest from August 17 to September 30. Every Monday, a theme or subject will be announced on Facebook and Twitter. You must create a diagram in Cacoo based on this theme and submit it by the following Sunday, 10 a.m. EST. If you are selected as a winner, we will require some form of eligibility verification. When sharing diagrams as a link, set to “Open diagram to public by URL” so that we can view your diagram. When you tweet your diagram, be sure to mention us @cacoocom and include the hashtags #BackToSchool and #withCacoo. We will create Facebook events for every week of the contest. Simply post your diagram on the Facebook event wall. Our lovely Tumblr page is where we share diagrams that we at Cacoo find to be creative and inspiring. 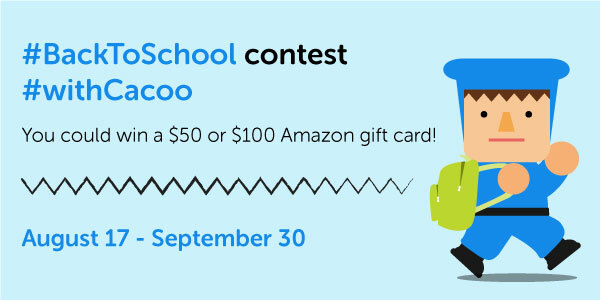 Submit your diagram and select the tags #withCacoo and #BackToSchoolContest. Please email your diagram submissions to us at community@nulab-inc.com only if you cannot send it via Facebook or Twitter. Submissions must be sent from a school-assigned email address with the subject “Back to School with Cacoo.” If you don’t have an email address ending in .edu, you may use a personal email address. Again, we will require eligibility verification if you are selected as a winner. We will pick the winner each week based on the diagram we think is the most creative and best shows Cacoo’s abilities. You don’t have to be the next Picasso, you just have to show your heart is in the work!